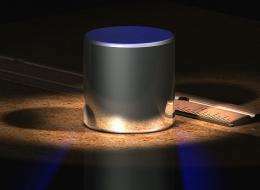 (PhysOrg.com)—The General Conference on Weights and Measures (CGPM) at its most recent meeting in Sčvres, France, has voted unanimously on a proposal to consider changes to at least some of the seven basic units (second, metre, kilogram, ampere, kelvin, mole and candela) of measurements used by most of the civilized world. This comes after years of debate concerning the kilogram, ampere, kelvin, and mole in particular. Of these, the kilogram has come under the most fire as it's still based on a hunk of metal kept under lock and key in a vault in Paris. It's been the subject of debate ever since it was discovered in 1948 that its mass had changed. The seven basic units of measurements are used as standards all by themselves, but also as a means of deriving virtually all other measurements (grams, hours, etc.) As science has become more precise so too has the need for ever more precise measurements, and some of the old ways of doing so are just not holding up. The kilograms shortcomings are obvious, it's the only one of the seven left still based on a manufactured object. A more accurate way to describe it would be to use a fundamental constant found in nature, such as the Planck constant. And this is exactly what a small group of metrologists has recommended. Peter Mohr, Terry Quinn, Barry Taylor and Edwin Williams recently banded together and published an article in the journal Metrologia that championed the switch to the Planck constant, and for changes to three other basic measurements as well: the ampere, kelvin, and mole. And it was this small group that lobbied for the proposed changes that have been addressed at the recent meeting of the CGPM. At the meeting, it was stressed that any new changes to the way measurements are based, should not change the basic ways that they are now conventionally used, e.g. water would still freeze at 0° C, and boil at 100° and cooking recipes would still work and world records in Olympic events would still all hold, etc. What would change would be the degree of accuracy that could be used to describe a mass, distance, time, etc. that would be consistent regardless of where the measurements were being taken and by whom. One good example is the metre (meter), a measurement not in need of change. It was originally based on an etching on a metal bar; now it's based on the distance light travels in a vacuum. This move by the CGPM means that proposals for the exact changes to be made will be considered and then voted on at the next meeting in 2014. If the changes pass, a timetable for their implementation will be set at that meeting as well. The CGPM also known as the conférence générale des poids et mesures, is just one of three entities charged with maintaining the International System of Units (SI) by decree of an international convention held way back in 1875. It represents 52 member states and 26 other associates. A small group of METROLOGISTS, not METEOROLOGISTS!!!! COME ON! They should also change the Pascal, which is so incredibly tiny that it's almost useless, and it doesn't really align to things that people actually encounter. You have to stop and think to know how much is 1.2 Megapascals, because you have to remember to multiply it by ten to get a meaningful answers relative to everyday stuff. That's probably why nobody bothers to use the unit when we have Bars. Pressure units are not fundamental. They are a complex unit combining force (mass, time and length) and area (length). So changing the Pascal would mean either changing the units of mass, time and/or length, or making the basic unit of pressure equal to some non-unitary ratio of Newtons and square meters (1 Pa = 1N/1m^2). The reason it is small is that a Newton is small and a square meter is large.